Diyar Al Muharraq has launched a mega housing project in partnership with Bahrain’s Ministry of Housing (MoH) that will see thousands of houses made available for citizens under the latter’s social housing and Mazaya initiative. 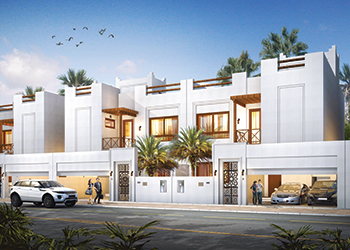 The ‘Deerat Al Oyoun’ community will comprise 3,100 villas built on a land area of 1.2 million sq m on the northwest side of Diyar Al Muharraq off the coast of Muharraq island. Under an agreement signed in March 2015, the MoH has committed to purchasing 3,100 residential units from Diyar Al Muharraq at a cost of BD276 million ($732 million) under the social housing and Mazaya schemes. Of the total units, 1,900 will be social housing units and 1,200 affordable Mazaya units. Diyar Al Muharraq will undertake financing of all construction works for the Deerat Al Oyoun project, its associated primary and secondary infrastructure and community centres. Key players on the project include Diyar Homes as development manager, Haj as project manager; Mott MacDonald as design and supervision consultant, DG Jones as cost consultant, and Aecom as primary infrastructure design and supervision consultant. A traditional Bahraini type of villa. Tenders have already been awarded for the social housing units as well as the primary and secondary infrastructure. Tenders for the Mazaya housing units will be awarded progressively over the next six months. He says the project’s site is considered an ideal residential area with integrated community service centres and green park spaces. Among the highlights of the development are the multiple shared community areas and its new architectural designs. Deerat Al Oyoun enjoys a strategic location due to its proximity to schools, shopping malls, public beaches, walkways, cycle paths, recreational facilities, mosques, medical clinics, public transport and the Bahrain International Airport. 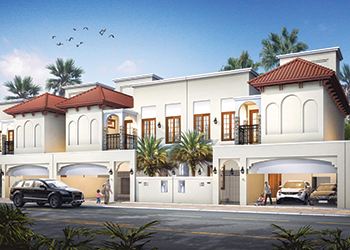 The project will offer Spanish and modern Bahraini (below) type of villas.. 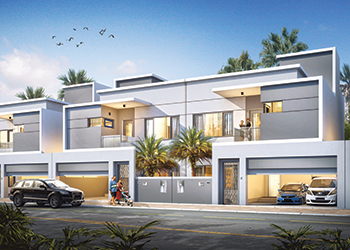 There will be four types of social housing villas including Traditional Bahraini, Spanish, Modern, and Mediterranean styles; while there will be one type of affordable housing villas under the Mazaya scheme. Work on the Deerat Al Oyoun project will be phased with a target completion date of three to four years. The first phase is expected to be ready by the end of 2017 and 600 to 1,000 homes will be added at every stage. “The final phase of the affordable (Mazaya) housing units should be completed latest by Q1 of 2019,” says Al Shaer. He says the residences will be constructed to the highest specifications to include thermal insulation, large living areas to allow the flow of natural light, car park space for two cars and provisions for future expansions. About the basis of allocation and prices of the units to beneficiaries, Al Shaer says these will be allocated by the MoH to Bahraini citizens that have met all the qualifying criteria and are already on the ministry’s waiting list. 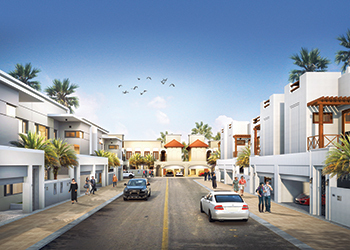 Diyar Al Muharraq Housing Development Company’s other projects include Al Qamra Al Bareh (seafront) freehold residential plots, Sarat residential plots, commercial villas and showrooms, Dragon City Mall and Dining village, Marassi Al Bahrain and Diyar Homes residential villas.